I love a good gallery wall. If I had to describe my style it would be ‘eclectic vintage with a side of gallery walls.’ In my fantasy land my walls are covered floor to ceiling with art and photos and other beautiful things. What I love about them so much is that when people come over to your home they can almost instantly get a sense of who you are as a person. In my opinion there are two kinds of gallery walls. Matching and uniform and eclectic and mismatched. Both have their merits so lets take a look at them both. This type of gallery wall is definitely more popular in homes across America. They are very pleasing to the eye and they are easier to accomplish in your own home. I love this look when all the images in the frames are related images like black and white photos of the same city or all portraits or something like that. 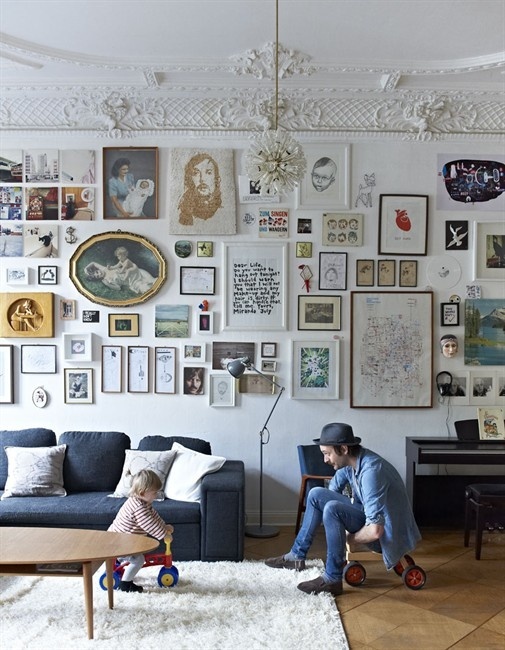 The problem with these types of gallery walls is that it can be expensive to buy that many frames that match. My tip to getting this look is getting frames from garage sales or thrift shops and then spray painting them in a uniform color like all black or all white. 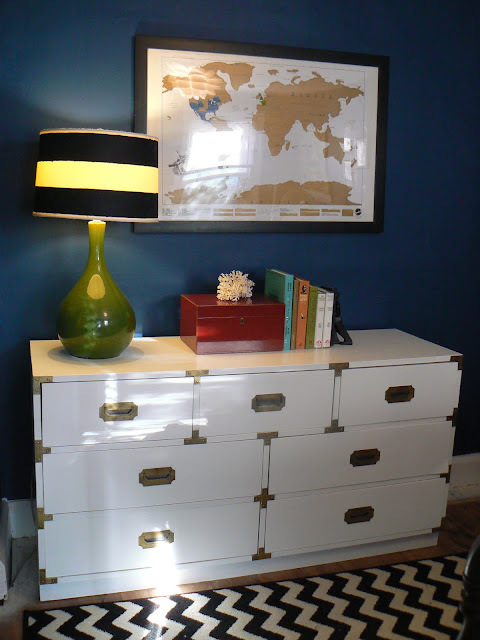 An easy way to create a template for a gallery wall like this is to use painter’s tape and computer paper to test out the placement of your frames. Oh, and always use a level. As I am sure you can guess this is my favorite type of gallery wall. I love the mismatched look of these walls, it’s as though they have been collected and cultivated over years of travel and experiences. The best thing about creating these kinds of walls is that there are no rules. You can uses whatever frames you want, whatever art you want, and you can go rouge and do unframed items. The daunting thing about this type of gallery wall is the fear that it won’t look the right kind of ‘mismatched.’ Well my advice is this: Do whatever you want. It’s your house! If you have thirteen black frames, five white ones, and two natural wood frames… use them all, mix it all together and do it with confidence. If that is hard for you I’ll try and give you a few tips from my own gallery walls. 1) Choose your wall. It can be a large main wall, a smaller section of wall, or a hallway. 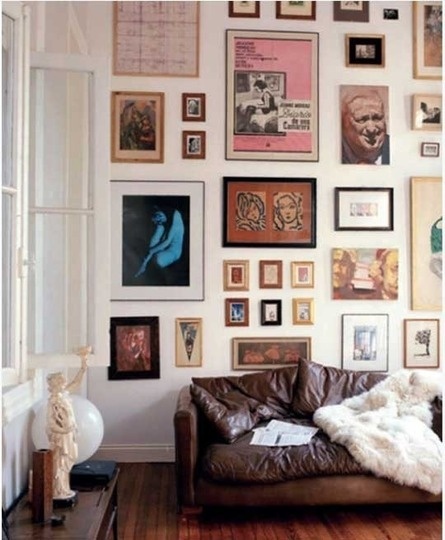 Once you find your wall get a good idea of the size of it (4’x6′, 2’x5′, etc) so you can plan your frames accordingly. I like to lay my frames out on the floor before I hang them so I can move them around until I find the perfect lay out. 2) Consider the surroundings. What color are the walls? What furniture will be near this wall? What is the overall feeling of this room? Will people be walking past or sitting under this gallery? Are you looking to showcase family photos or your map collection? Once you answer these questions you will have a better idea of what type of gallery suites your room best. 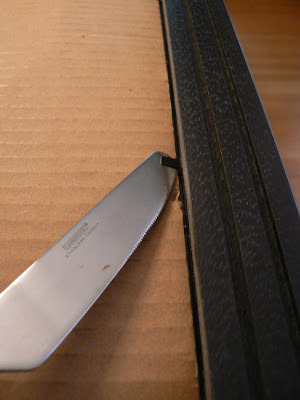 3) Use what you have. If you want a perfectly uniform gallery wall you may have to make some purchases but if you go for a more free form look you can easily pool together what you already have and make it work. Gather the frames you have and start playing with arrangements. Don’t worry if the frames aren’t filled with the perfect pictures yet you can work on that later (in fact, tomorrow I’m going to post on what to put in all those frames). 4) Push yourself. 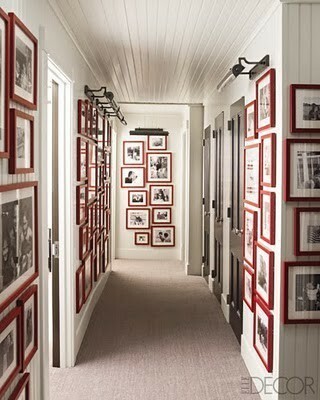 This may seem like a weird step for gallery walls but this is something I really try to do myself. Yes, perfectly matching frames with perfect family photos in black and white looks amazing but an important part of designing your own home is accepting imperfection. Don’t second guess yourself. If you like something go for it. Maybe you’ve never seen black and white frames mixed together but that doesn’t mean it won’t look good. 5) Go with the flow. Probably the best thing about gallery walls is that they are fluid. I have rearranged, added, and subtracted items on my gallery walls several times. Some changes are simple like exchanging one photograph for another or spray painting a frame, other changes are more complex. A couple of months ago I bought a larger piece of art and decided to add it to my dining room gallery wall so I took down two smaller items and added the new large piece in their place. The first image is from about a month after I moved in and the second is just a few days ago. You can see the difference between the two. Is started out smaller and over the past few months I got a little bolder and when all the way to the ceiling. Tomorrow I’ll be back with my tips on what to fill all those frames with.